The Eastern Conference-leading Boston Bruins returned from the 57th annual NHL All-Star Game with a scrappy 3-2 overtime win Tuesday over the potent Washington Capitals in a battle of division leaders at TD Banknorth Garden. The Bruins, who approached the All-Star Game with seven of their top 20 players injured, were buoyed by the return of defenseman Andrew Ference, and forwards Milan Lucic and Patrice Bergeron. The Bruins can certainly use the skills of the veteran Ference and the energetic sophomore Lucic, but all eyes were on Bergeron, who has missed most of the past two seasons, including the past 15 games, due to concussions. Bergeron last played Dec. 20 when he suffered his second NHL concussion while checking Carolina's Dennis Seidenberg. Bergeron's jaw caught Seidenberg's shoulder and he dropped hard to the ice. The Bruins will be a much better team if Bergeron can return to the level of play he displayed in 2006-07, when he had 22 goals and 48 assists for 70 points in 77 games. Bergeron, 23, played only 10 games last season, and had 4 goals and 15 assists for 19 points in 32 games this season before his injury. Some say he was playing more tentatively than in the past. There is a fear he will be reluctant to initiate body contact. Those fears were allayed 14:12 into the second period when Bergeron dove to beat Alexander Semin to a puck in Washington's zone while sliding toward the left boards. Bergeron quickly rose to his feet and fired a dart to Marc Savard in the far side of the slot, just in front of the opposite faceoff circle, for a power-play goal that tied the game 2-2, giving the Bruins a chance to win in overtime. Bergeron said he felt more comfortable returning to the lineup Tuesday than he did at training camp, when he was returning from the concussion that cost him most of the 2007-08 season. "I'm confident. We all know we are going to go through some tough times and we have to show some character," he said. "Going through adversity builds a good team." Bergeron's play was a gamble because defenseman Zdeno Chara had been caught up ice, trying to push a puck past Jose Theodore. Bergeron was the last man back against one of the NHL's fastest young skaters. Coach Claude Julien was glad to get the goal and the victory but Bergeron's play seemed in violation of the cautious system that Julien installed last year -- one that has benefited the Bruins. "It wasn't so much his risk more than it was the other guys not really reacting," Julien said. "What if he doesn't get it? I thought we tied the game on a bit of a lucky break. If he doesn't keep it in, it's a two-on-none, and it could have easily been 3-1 instead of 2-2." "I went for it," Bergeron said. "I knew it was kind of a risky play. You try sometimes and don't get any results. But it worked. As soon as I got up, I knew 'Savvy' was going to be there. I saw him from the side a little bit. I just threw him a pass and he made a great play. Lot of patience and he put it in." Bergeron's natural position is center but Julien decided to ease him back into the lineup by playing him at right wing on a line with center David Krejci and Blake Wheeler. Michael Ryder normally plays right wing on that line but missed the game with the flu. It was Bergeron's injury last season that opened the door for Krejci to replace him at second-line center -- and Krejci has made the most of his opportunity. The Bruins are rich in centers, right down to their AHL lineup in Providence. First-line right wing Phil Kessel is also a center. Veteran Stephane Yelle centers a checking line while Petteri Nokelainen, Vladimir Sobotka and Martin St. Pierre have centered the fourth line. Zach Hamill, the Bruins' first-round pick in 2007, is rebounding from early-season wrist surgery with the Providence Bruins. Buffalo blue liners bash Oilers -- A lot of Bruins' fans watched the post-game show and saw that Montreal, Ottawa and Toronto all lost, then and went to bed knowing Buffalo had a tough pair of back-to-back games with Edmonton and Calgary on Tuesday and Wednesday. Visions of sweeps vied with sugar plums in their dreams -- but they woke up to find Buffalo not only won the fourth of their last five games and eighth of 11 in 2009 but that they crushed the Oilers 10-2, scoring early and often. How early? Drew Stafford scored the first goal of his hat trick 10 seconds into the game. 10 seconds! Defenseman Nathan Paetsch scored 61 seconds later. "When you're the home team and you get an early one scored against you, you've got to pick yourself up right away," Sabres coach Lindy Ruff said. "Even worse than that is we got the second one quick, too, and that digs an even bigger hole. It takes the fans right out of the game." Tim Connolly had two goals and a world-class pass on Stafford's third goal. Connolly's skating and stickhandling talent is amazing. Sabres' apologists (I'm guilty) have been claiming all season that the Sabres would be formidable when Connolly and defenseman Craig Rivet returned to the lineup. Rivet had two assists. Buffalo's defensemen had five points in the game. Jaroslav Spacek had a goal that Rivet assisted on. The Sabres aren't thrilled with their season, thus far, but only eight NHL teams have won more games and they are only five points behind the Montreal Canadiens for second place in the Northeast Division. Look for them to tighten the race. Class move by Wilson -- Minneapolis Star-Tribune hockey writer Mike Russo keeps a close eye on morning practices and noticed Toronto Maple Leafs coach Ron Wilson appear by the Minnesota Wild bench Tuesday morning to shake hands with Wild defenseman Kurtis Foster. Wilson was coaching the San Jose Sharks last season when one of his rookie players crashed into Foster while trailing on an icing play. Foster was knocked off-balance and crashed heavily into the boards, breaking his left leg. He suffered a displaced femur fracture that required the installation of a steel rod. Foster has been rehabilitating his leg and still walks with a limp but he began practicing with the team earlier this month and traveled with the Wild on the last road trip. He'll continue to travel with the team so that he can continue practicing. A club official said the WIld expect Foster will go to the AHL Houston Aeros in a couple of weeks for conditioning before rejoining the roster. 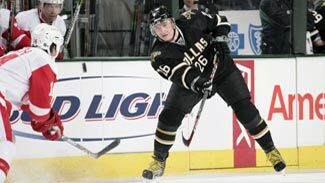 Foster, a member of the 2002 Chicago Wolves Calder Cup championship team, is a class act, the winner of the AHL's 2004 Yanick Dupre Memorial Award for outstanding humanitarian contributions. He has played 176 NHL games with 20 goals and 51 assists. Wilson is a longtime NHL insider and said after the incident that the NHL should adopt automatic icing. Russo asked Wilson about the handshake. "It's been a long process. He was developing into a fine player and hopefully he'll be able to overcome this injury and get his career back on line," Wilson said. Wilson has been taking a pummeling from a noted broadcaster this season about his perceived lack of warmth -- he's as dry as week-old rye bread -- but this is the real Ron Wilson. News and Notes -- Maple Leafs defenseman Mike Van Ryn returned to the lineup Tuesday night for the first time since suffering a concussion on Dec. 18, his second this season. Van Ryn was signed as a free agent last summer and his almost season-long absence has been a big factor in Toronto's struggles ... The Boston Globe's Kevin Paul Dupont reports that it's highly unlikely Marco Sturm will return this season after undergoing knee surgery earlier this month ... Canada's World Junior championship victory over Sweden has been rough on Ottawa Senators' captain Daniel Alfredsson. First, he had to shovel Shean Donovan's backyard rink, and Wednesday he was forced to practice in a Team Canada jersey after losing a bet to team owner Eugene Melnyk ... Veteran defenseman Jason Smith of the Ottawa Senators was a healthy scratch Tuesday night for the first time since he played with Toronto in the late 1990s ... Ottawa sent goalie Martin Gerber, in the last year of his contract, to Binghamton on Tuesday after first trying to trade him ... Feb. 19 will be a big day in Ottawa: U.S. President Barack Obama will visit Canadian Prime Minister Stephen Harper and the Vancouver Canucks will be in town to play the Senators ... Montreal fans took a lot of criticism voting Alex Kovalev the starting right wing in the 57th annual NHL All-Star Game over Washington's Alex Ovechkin, but No. 27 didn't disappoint the home crowd at the Bell Centre, winning the MVP after scoring twice and getting the game winner in the shootout. "You can't ask for anything more than this in front of your hometown, to get MVP," Kovalev said.